I took both pumps back to our Indianapolis facility and a couple days later shared our estimate with the maintenance manager. 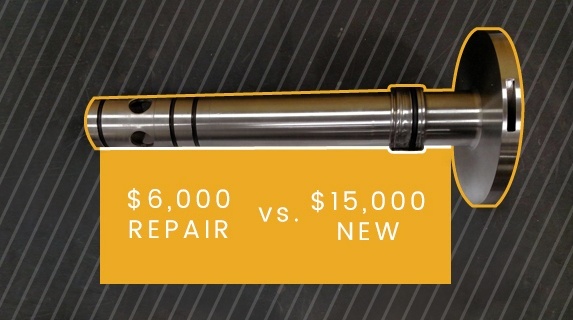 He gave us the go ahead, and we repaired both pumps to like-new condition for a total of $12,000. For comparison, the maintenance manager had recently purchased two new replacement pumps, which came in at about $15,000 each. That means we repaired both pumps for less than it cost to purchase one. Since this repair took place after he had already replaced the pumps, these pumps are stored and ready to be rotated in the next time a set goes bad. Even though this happened recently, we've already worked with the same plant to repair a few more centripetal pumps, repair a spindle, and order some spare parts. My experience with this plant was a good reminder that current and potential customers aren’t always aware of what we offer or what we can do for them. It’s pretty typical for a customer to be unaware of what can and can’t be repaired, which is why it’s good to partner with a provider who does specialize in these areas. That way, when needs or opportunities come up, they have a trusted partner who can advise them and look out for their best interests. If you found this story interesting, know that this isn’t a once in a million kind of situation. This sort of thing happens more often than most would think. Instead of leaving money on the table, contact a Separators rep and see how much you can save.